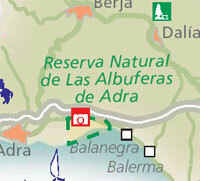 The trekking route takes places along a protected humid area of Albufera. This landscape has a great ecologic value and interest and the access is easy and give us the opportunity of watching the aquatic birds in the albufera (pool) of Adra, 7 km. from the town towards Almería. We can see how the fauna of the area has adapted itself to the plastic sea covering the cultivations around the Honda Albufera and Nueva Albufera. There are so many species of birds building their nests in the place, that costitutes the albufera as an area of incredible beauty worth visiting any time in the year.